As you approach 32 Farmhouse you will be impressed by the manicured grounds of this over-sized corner lot. 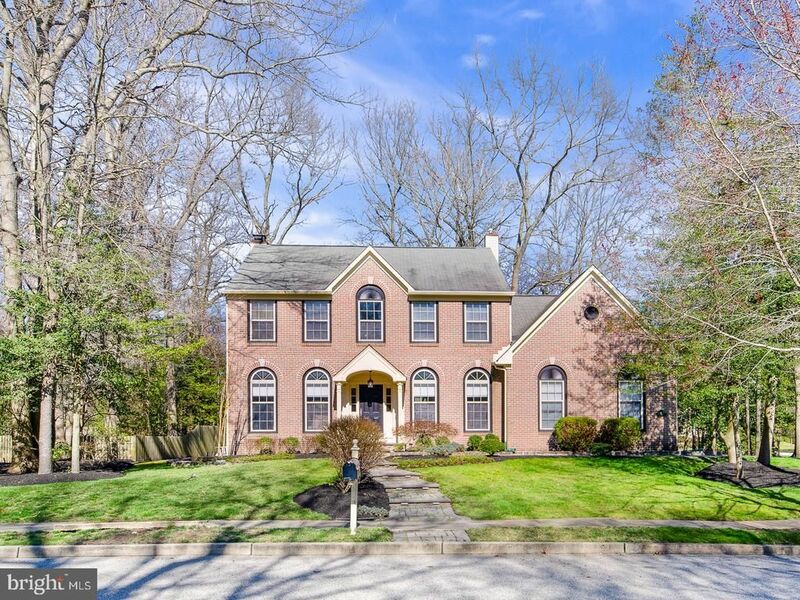 The paver walkways lead you to this classic brick front home with side entry garage. The custom portico addition covered porch has trimmed columns and leads to the front door. The 2 story foyer has wainscoting and custom trim around the doors. The hardwood staircase and the natural cherry hardwood floors compliment the the freshly painted walls. The first floor has all 9 ft ceilings and floor to ceiling windows adding lots of natural light. The formal dining room has wainscoting, dentil crown molding and windows with palladium tops. The dining room has plenty of room for a very large dining table. A butlers pantry is located next to the dining room with cabinets and granite tops. The formal living area has dentil molding and freshly painted walls in today~s agreeable gray. The sellers have opened up the wall between the living room and family room for ease of entertaining. The Architectural columns and molding define the space. The focal of the family room is the wood burning fireplace that has a marble surround and crisp white mantel. The triple windows in the family room have a built in window seat. The crown molding frames the room. This home has been customized to have the family room and the kitchen open to each other. The gourmet kitchen has an expansive center island, a Viking stainless cooktop with 6 burners and an industrial Viking hood vent. The Uline wine refrigerator, stainless oven, a convection microwave and dishwasher will make meal prep and serving a breeze. The rich Cherry cabinets have granite counter tops and a ceramic backsplash all highlighted by recessed lighting. The pantry area has built in cabinets and a Miele Espresso maker. The kitchen floor has 24x24 neutral ceramic tile floors that continue to the breakfast room. The vaulted ceilings in the breakfast room add drama to this fabulous room. A walk in pantry has plenty of storage. The triple Anderson slider leads to the sunroom addition. The sunroom has 18 ft vaulted ceilings an enormous palladium window, ceramic tile floors and walls of windows bringing the outside in. The paver patio adds additional outdoor entertaining space. The backyard has plenty of room for a pool or play equipment. The hardwood staircase with runner leads to the 2nd floor. Enter the master suite through the double doors the vaulted ceilings add drama to this amazing room. The neutral patterned carpet and freshly painted walls enhance the suite. The newer luxurious master bath has 2 gray cabinet bases with square sink tops and nickel accents. The soaking tub and stall shower have subway tile with a decorative listello accent. The wood look ceramic tile finishes the retreat! The suite has plenty of closet space. The sellers have added a sitting area with French doors. This could be a great home office. The other bedrooms are nicely sized and neutrally decorated. The main bath has been updated and has double sinks with bronze accents. The wood look ceramic floor is a nice accent. The French door leading to the amazing basement. The basement has a built in wet bar with wine refrigerator. The custom bar has granite counters and wood look laminate floors. The recreation room has a gas fireplace with black granite surround and white mantle. Built in bookcases are a great place for storage. There is another room being used as an office but could also be a gym or playroom. This home is all updated and move in ready and set on one of the nicest lots in the community. Carriagebrooke Farms is very close to the Patco station making it an easy commute to Phila. Do not hesitate this home is awesome!